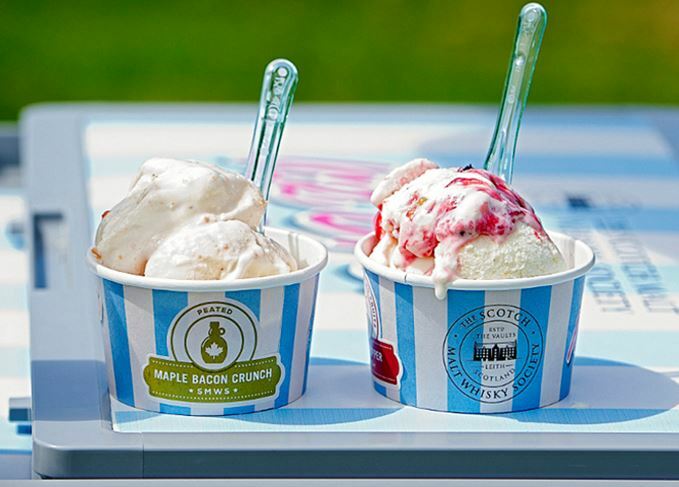 The Scotch Malt Whisky Society (SMWS) has launched a range of 12 whisky ice creams, available to buy this summer from its new Kaleidoscope bar in London. The 12 ‘Ice Dream Drams’ have been made with Scottish ice cream company S Luca, using SMWS single cask whiskies to reflect the 12 flavour profiles with which the Society categorises its bottlings. The alcoholic ice creams, which range from 3.7% to 4.9% abv, include Salty Sea Dog (salted caramel with oily and coastal whisky), Green Goddess (lime with lightly-peated whisky) and Banana-Dram-A (banana and marshmallow with mellow, fruity whisky). New bar: SMWS's Kaleidoscope recently opened in the City of London The ice creams will be exclusively available throughout August at the Devonshire Square location, which welcomes non-members to taste SMWS bottlings. S Luca has been operating since 1908 – when Luca Scappaticcio and his wife Anastasia opened their first ice cream parlour in Musselburgh – and previously linked up with the SMWS in 2015. If you don't live in London, or prefer to make your own ice-cream at home, whisky and food writer Martine Nouet has some delicious whisky ice cream recipes and tips for incorporating your favourite dram into an indulgent summer treat.